Eclipse as a brand is the sum of its parts (all of the Projects), and Projects should strive for the highest possible quality in extensible frameworks, exemplary tools, transparent processes, and project openness. Projects must have diversity goals to ensure diversity of thought and avoid relying on any one company or organization. At the same time, we acknowledge that enforcing a particular diversity metric is a poor way to achieve these goals; rather we expect the project leadership to help the diversity evolve organically. Projects are required to explain their diversity efforts and accomplishments during Reviews. Adopters - an active and engaged adopter/plug-in developer community is the only way to prove that an Eclipse project is providing extensible frameworks and extensible tools accessible via documented APIs. Reuse of the frameworks within the companies that are contributing to the project is necessary, but not sufficient to demonstrate an adopter community. Again, creating, encouraging, and nurturing an adopter community outside of the Project's developers takes time, energy, and creativity by the Project Leadership, but is essential to the Project's long-term open source success. This document and any additional criteria as established by the EMO contains requirements, recommendations, and suggestions. This version of the document adds the word "Project" to the title of this section to better qualify that it discusses the structure and organization of projects. The previous version of this document defined notions of "Operating" and "Container" Projects. These notions have been abandoned in favour of a more generalized notion of Project. Under this new structure, projects can opt to function as Operating Projects by choosing not to maintain a code repository. 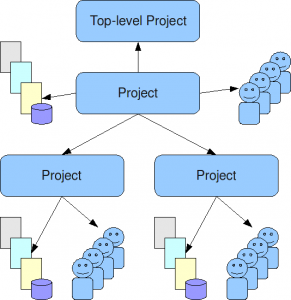 Eclipse Projects are organized hierarchically. A special type of Project, Top-Level Projects, sit at the top of the hierarchy. Each Top-Level Project contains one or more Projects. Each Project may itself contain zero or more Projects. A project that has one or more Projects is said to be the "parent" of those Projects. A Project that has a parent is oftentimes referred to as a Sub-Project. The term Project refers to either a Top-Level Project or a Sub-Project. Projects may be referred to as Sub-Projects or Components, but the choice of common name does not change the characteristics of the Project. The previous version of this document introduced a notion of a "union" of committers that was never fully defined or utilized. That notion has been removed. We attempt to make it clear that each project has exactly one set of committers. This has been driven by the negative experiences of the past in attempting to manage multiple committer groups in a single project. We further attempt to make it clear that there is no roll-up of committers; a committer in a sub-project is not automatically a committer in a parent project. Each project has exactly one set of committers. Each Project's set of Committers is distinct from that of any other Project, including Sub-Projects or parent Projects. All Project Committers have equal rights and responsibilities within the Project. Partitioning of responsibility within a Project is managed using social convention. A Project may, for example, divide itself into logical partitions of functionality; it is social convention that prevents Committers from one logical partition from doing inappropriate work in another. If finer-grained management of committer responsibilities is required, a project should consider partitioning (via a Restructuring Review) into two or more Sub-Projects. The Committers of a project have the exclusive right to elect new Committers to their Project–no other group, including a parent Project, can force a Project to accept a new Committer. There is no roll-up of committers: the set of committers on a project is exactly that set of people who have been explicitly elected into that role for the project (i.e. being a committer on a sub-project does not give you any automatic rights on the "parent" project). In practical terms, each Project has a single Unix group of its Committers that provides write-access to the Project's resources. Pictorially below, we see that a Project, in addition to the various resources and Committers it has, can also have zero or more Sub-Projects. Each of these Sub-Projects has its own distinct set of Committers and resources. The previous version of this document restricted code ownership to the former notion of "Operating" projects. With the generalization of projects, it is now possible for a project at any level in the hierarchy to have (or not have) code. This version of the document clarifies that a project in the incubation phase may make pre-1.0 releases only. A project is not strictly required to make use of all the resources made available; a project might, for example, opt to not maintain a source code repository. Such a Project might operate as an organizational unit, or container, for several Sub-Projects. Similarly, a Project might opt to provide a consolidated website, build and/or download site for its Sub-Projects (the Sub-Projects would then not require those resources for themselves). Each Project has a single Bugzilla component for its bugs. Any Project in the Mature Phase may make a Release. A Project in the Incubation Phase with two Mentors may make a pre-1.0 Release. A Release may include the code from any subset of the Project's descendants. Projects are the level of communication with the larger Eclipse community and ecosystem. Projects may either have their own communications (website, mailing lists, forums/newsgroups, etc) or they may be part of a parent Project's communications (website, mailing list, forums/newsgroups, etc). In either case, the Project is required to maintain an open and public communication channel with the Eclipse community including, but not limited to, project plans, schedules, design discussions, and so on. The Scope of a Sub-Project is defined by the initial project proposal as reviewed and approved by the Project Management Committee (PMC) (as further defined below) of the Project's Project's top parent and by the EMO. A Project's Scope must be a subset of its parent's Scope. The previous version of this document used confusing language in an attempt to combine the discussion of PMCs and Project Leads. This version separates these discussions in an attempt to make more explicit the process of bringing leaders on board and the role that the two different types of leaders play. Sections 4.6.1 and 4.6.2 are new with this version of the document. See Bug 300002 and Bug 300006.
ensure that the Project and its Sub-Projects (if any) conform to the Eclipse Foundation IP Policy and Procedures. The leadership for a Project is composed of the Project's Project Lead(s), the leadership of the parent Project (if any) and the PMC Leads and PMC Members for the Top-Level Project. PMC Leads are approved by the Board; PMC members are elected by the existing PMC Leads and Members, and approved by the EMO(ED). Eclipse Projects are managed by one or more Project Leads. Project Leads are responsible for ensuring that their Project's Committers are following the Eclipse Development Process, and that the project is engaging in the right sorts of activities to develop vibrant communities of users, adopters, and contributors. The initial project leadership is appointed and approved in the creation review. Subsequently, additional Project Leads must be elected by the project's Committers and approved by the Project's PMC and the EMO(ED). In the unlikely event that a member of the Project leadership becomes disruptive to the process or ceases to contribute for an extended period, the member may be removed by the unanimous vote of the remaining Project Leads (if there are at least two other Project Leads), or unanimous vote of the Project's PMC. In exceptional situations, such as projects with zero active committers or projects with disruptive Committers and no effective Project Leads, the Project Leadership Chain has the authority to make changes (add, remove) to the set of committers and/or Project Leads of that project. The previous version made specific references to the types of resources that a committer has write access to (code, web, and Bugzilla). In this version, the discussion of the resources has been generalized. Active participation in the user forums/newsgroups and the appropriate developer mailing lists is a responsibility of all Committers, and is critical to the success of the Project. Committers are required to monitor and contribute to the user forums/newsgroups. The Architecture Council is responsible for the development, articulation, and maintenance of the Eclipse Platform Architecture and ensuring the Principles of the Development Process through mentorship. Membership in the Architecture Council is per the Bylaws through Strategic Membership, PMCs, and by appointment. The Architecture Council will, at least annually, recommend to the EMO(ED), Eclipse Members who have sufficient experience, wisdom, and time to be appointed to the Architecture Council and serve as Mentors. Election as a Mentor is a highly visible confirmation of the Eclipse community's respect for the candidate's technical vision, good judgement, software development skills, past and future contributions to Eclipse. It is a role that should be neither given nor taken lightly. Appointed members of the Architecture Council are appointed to two year renewable terms. This version of this document formalizes the notion of an "Incubator" project. The original draft of this document attempted to restrict the number and structure of incubators, but the language was removed to allow for future flexibility. A project may have more than one incubator; an incubator project may itself have an incubator sub-project. Creating multiple incubators is expected to be atypical; attempts to create multiple incubators will be challenged by the PMC and EMO. An important requirement for an incubator is that there must be some set of committers from the parent project who are also committers on the incubator. Since incubators are never expected to graduate, they do not require mentors. A Project may designate a Sub-Project as an "Incubator". An Incubator is a Project that is intended to perpetually remain in the Incubation phase. Incubators are an excellent place to innovate, test new ideas, grow functionality that may one day be moved into another Project, and develop new committers. Incubator Projects never have releases; they do not require yearly continuation reviews and they are not part of the annual release train. Incubators may have builds, and downloads. They conform to the standard incubation branding requirements and are subject to the IP due diligence rules outlined for incubating Projects. Incubators do not graduate. The scope of an Incubator Project must fall within the scope of its parent project. The committer group of the Incubator Project must overlap with that of the parent project (at least one committer from the parent project must be a committer for the Incubator). Incubator projects do not require Architecture Council mentors (the parent project's committers are responsible for ensuring that the Incubator project conform to the rules set forth by the Eclipse Development Process). An Incubator project should designated as such by including the word "Incubator" in its name (e.g. "Eclipse Incubator"). To do otherwise is considered exceptional and requires approval from the PMC and EMO(ED). Only Top-Level Projects and Projects in the Mature phase may create an Incubator. Incubators are created via a Creation Review. Alternatively, an Incubator can be created as part of a Graduation, Promotion, or Restructuring Review. This section has been modified to explicitly state that project may opt to aggregate their plan with that of descendant projects. The process of producing or updating the Roadmap is expected to be iterative. An initial set of Themes and Priorities may be infeasible to implement in the desired timeframe; subsequent consideration may reveal new implementation alternatives or critical requirements that alter the team's perspective on priorities. The EMO orchestrates interaction among and within the Councils to drive the Roadmap to convergence. A project may produce an aggregate plan for itself and its descendants. In this case descendents would share their ancestor's plan. Projects must provide advanced notification of upcoming features and frameworks via their Project Plan. New Proposals that intend to do a Release are required to have at least two Mentors. New Proposals that will only Release code as part of a parent Project's Release are not required to have Mentors. Mentors must be members of the Architecture Council. The Mentors (including name, affiliation, and current Eclipse projects/roles) must be listed in the Proposal. Mentors are required to monitor and advise the new Project during its Incubation Phase, but are released from that duty once the Project graduates to the Mature Phase. The proposers, in conjunction with the destination PMC and the community, collaborate in public to enhance, refine, and clarify the proposal. Mentors (if necessary) for the project must be identified during this phase. The Proposal phase ends with a Creation Review, or withdrawal. The Proposal may be withdrawn by the proposers. The EMO(ED) will withdraw a proposal that has been inactive for more than six months. After the project has been created, the purpose of the incubation phase is to establish a fully-functioning open-source project. In this context, incubation is about developing the process, the community, and the technology. Incubation is a phase rather than a place: new projects may be incubated under any existing Project. The Incubation phase may continue with a Continuation Review or a Release Review. Designated Incubator Projects may remain perpetually in the Incubation phase; no reviews are required. Only projects that are properly identified as being in the incubation phase (including designated Incubator Projects) may use the Parallel IP process to reduce IP clearance process for new contributions. Mature phase projects have Releases through Release Reviews. A Mature Project may be promoted to a Top-Level Project through a Promotion Review. A Mature Project that does not participate in a Release in given year may continue through a Continuation Review. See guidelines and checklists about being a top-level project. Projects that have demonstrated the characteristics of a Top-Level Project (e.g., consistent leadership in a technical area and the recruitment of a wider developer community) can be promoted to Top-Level Project status. This promotion occurs through a Promotion Review. Upon the successful completion of a Promotion Review, the EMO(ED) may recommend that the project be promoted to the Board of Directors and ask that its Charter be reviewed and approved. Projects that become inactive, either through dwindling resources or by reaching their natural conclusion, are archived. Projects can reach their natural conclusion in a number of ways: for example, a project might become so popular that it is absorbed into one of the other major frameworks. Projects are moved to Archived status through a Termination Review. This iteration of the document removes the notion of a "review call" in favour of a "review period" during which the community is given an opportunity to comment. This acknowledges the reality that the optional review calls required by the previous version of this document never actually occurred. Given that there will be no review calls, references to "slides" have been removed. All Projects are required to participate in at least one Review per year. Prior to the start of the review period, the Project leadership provides the EMO with review documentation. The review documentation material always includes a document that describes the review. The minimum contents of the document are specified by the individual Review types. The presentation material must be available in a format that anyone in the Eclipse membership can review. For example, Microsoft Powerpoint files are not an acceptable single format: such files may be one of the formats, but not the only format. Similarly for Apple Keynote files and Microsoft Word files. PDF and HTML are acceptable single formats. The presentation material must have a correct copyright statement and license. The presentation material must be archival quality. This means that the materials must be comprehensible and complete on their own without requiring explanation by a human presenter, reference to a wiki, or to other non-archived web pages. For Continuation, Graduation and Release Reviews, the project must have a current project plan, in the format specified by the EMO, available to the community. The Review period is open for no less than one week and usually no more than two weeks of generally accepted business days. The proper functioning of the Eclipse Development Process is contingent on the active participation of the Eclipse Members and Committers, especially in Reviews, thus each Review has an EMO-designated discussion and feedback communication channel: a forum/newgroup, a mailing list, or some other public forum. If a Committer election is required for a Review (for example, for a Creation Review), then it is held simultaneously with the Review period. Thus the election and the Review will end at the same time, allowing quick and efficient provisioning of the resulting Project. The EMO(ED) approves or fails the Review based on the public comments, the scope of the Project, and the Purposes of the Eclipse Foundation as defined in the Bylaws. The Review ends with the announcement of the results in the defined Review communication channel (the EMO(ED) will request that the Project Lead make this announcement). The Graduation Review is about the phase change from Incubation Phase to Mature Phase. If the Project and/or some of its code is simultaneously relocating to another Project, the Graduation Review will be combined with a Restructuring Review. The purpose of a Promotion Review is to determine if the Project has demonstrated the characteristics of a Top-Level Project, e.g., consistent leadership in a technical area and the recruitment of a wider developer community. The Project will already be a well-functioning Mature Eclipse Project, so evidence to the contrary will be a negative for promotion. Top-Level Projects, both through their existence and their Council memberships, have substantial influence over direction and operation of Eclipse, thus it behooves the membership to grant Top-Level status only for merit: for demonstrated service to the larger Eclipse ecosystem. The purpose of a Termination Review is to provide a final opportunity for the Committers and/or Eclipse membership to discuss the proposed withdrawal of a Proposal or archiving of a Project. The desired outcome is to find sufficient evidence of renewed interest and resources in keeping the Project or Proposal active. A Move Review is considered to be a special type of Restructuring Review. This iteration of the document provides more detail on Restructuring Reviews. It also considers a Move Review (as defined by the previous version of this document) to be a special type of a Restructuring Review. This version of the document makes explicit a loophole that permits the creation of new projects without engaging in the full proposal/creation process. This applies only to new project with a scope that is a subset of the original project's scope. There is no explicit requirement that a project become a parent to the new projects. New projects can be created as siblings or elsewhere in the project hierarchy. In the event that a restructuring review results in unrelated projects, it is expected that the scope of the original project will be adjusted accordingly. A Restructuring Review may include the movement of significant chunks of code. A move is considered significant if it has an impact on the community (i.e. if segments of the community will notice that the code has moved). This may include entire projects, bundles, and features, but likely excludes small fragments, code snippets and individual files. The IP Log of all moved code must be reviewed prior to the start of the review period (this, typically, is a subset of the project's IP Log). If all of the code is moved out of a project, a Termination Review for that project can be combined with the Restructuring Review. Note that, regardless of whether or not a review is required, moving code from one Project to another is subject to the Eclipse IP Policy. A project is expected to socialize pending changes using established communication channels prior to initiating the review. A Restructuring Review must provide the community with at least one week to review and respond to the changes. Prior to the start of that review period, the community must be provided with (via the EMO) completed review documentation that describes in specific terms what will be changed as part of the restructuring. This section has been modified to explicitly allow multiple projects to participate in a single. It is possible, for example, for a project and its descendants to engage in a simultaneous Release Review. It should be noted that the purpose of combining reviews is to better serve the community, rather than to reduce effort on the part of the project (though it is fortunate when it does both). Combining a Release and Graduation review, or aggregating a Release Review of a Project and several of it's child Projects generally makes sense. Combining Release Reviews for multiple unrelated projects most likely does not. In the event of a conflict between this document and a Board-approved project charter, the most recently approved document will take precedence. This document was approved by the Eclipse Foundation Board of Directors in its meeting on May 19/2010. It takes effect (replacing all previous versions) on August 1/2010.